The failed Soviet lunar program, and the follow-on lunar base projects that came to nothing. 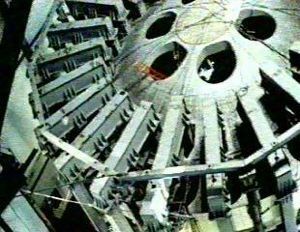 The first approach to the rather vague last objective was to use nuclear power - a nuclear reactor heating ammonia propellant. Korolev's OKB-1 completed a draft project for three variants of rockets using such a propulsion system. The third variant designed was a 'Super Rocket' with a lift-off mass of 2,000 metric tons and a payload of 150 metric tons. This was a true antecedent of the later N1 moon rocket. 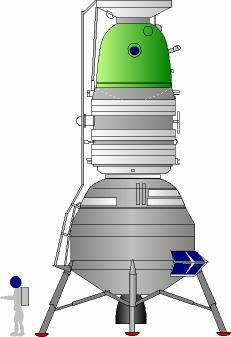 The first and second stages were in the conical 'raketov' form later adopted for the N1. The first stage used a massive cluster of Kuznetsov NK-9 engines each with a thrust of 52 metric tons. 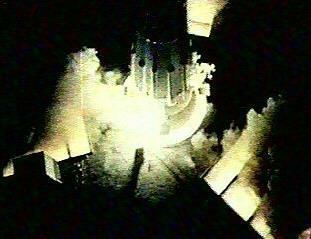 The second stage used four nuclear engines with a total thrust of 850 metric tons. 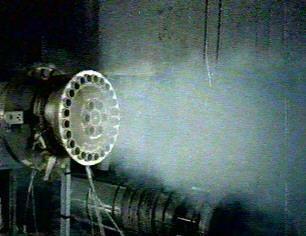 Operating at a temperature of 3500 degrees K a specific impulse of 550 seconds in vacuum using ammonia propellant was expected. A mixture of liquid hydrogen and methane was considered as a better-performance propellant at a later date. 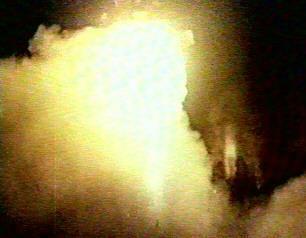 Although ideal for use in nuclear rockets, use of liquid hydrogen as a propellant was not considered technically possible in the short term. Work on this form of nuclear propulsion was abandoned at the end of 1959 when it became apparent that conventional chemical propulsion could provide nearly equivalent performance with less development, safety, and environmental risk. Korolev had designed the Vostok manned spacecraft that gave Russia the lead in the space race in the first half of the 1960's. Studies for a follow-on to Vostok, with the objective of sending a manned capsule on a circumlunar flight, began in 1959 under Tikhonravov. At this point it was assumed that any such flight would be at an early date and require use of launch vehicles derived from Korolev's R-7 ICBM. Since planned derivatives of the R-7 could not put more than six metric tons into orbit, it was immediately obvious that a circumlunar spacecraft would have to be assembled in low earth orbit from several R-7 launches. Therefore it would be necessary to perfect techniques for rendezvous, docking, and refueling of rocket stages in orbit. By 1960 to 1961 the studies, now dubbed 'L1', were expanded to cover automatic rendezvous and docking of several stages, and use of manipulators to assemble the stages. Meanwhile the configuration of the re-entry vehicle for a Vostok follow-on was being investigated by other sections of Korolev's bureau. Lead for work on the re-entry problem was Section 11. There was no shortage of ideas. In 1959 Chief Designer Tsybin of OKB-256 and Solovyev of OKB-1 Section 9 both offered designs for a winged manned spacecraft with a hypersonic lift-to-drag ratio of over 1.0. Prugnikov of Section 8 and Feoktistov of Section 9 proposed development of a ballistic capsule composed of variations of 'segmented spheres'. Korolev requested TsAGI, the state's Central Aerodynamic-Hydrodynamic Institute, to investigate all possible configurations. In a letter from A I Makarevskiy to Korolev on 9 September 1959 TsAGI set out its study plan. Aerodynamic characteristics at various angles of attack for a wide range of winged, spherical, elliptical, sphere-with cones, and conical shapes were to be analyzed at velocities from Mach 0.3 to Mach 25. The ballistic vehicle was to have a basic diameter of 2.5 m, a total internal volume of 3 to 3.5 cubic meters, and a living volume of 2 to 3 cubic meters. Separately considered for all configurations were aerodynamics of ejection seats or capsules with a diameter of 0.9 cubic meters and a length of 1.85 meters. Most of the work was promised for completion by the end of 1959. To exploit this database, Reshetin started a project group to conduct trade-off studies of the various configurations at the beginning of 1960. The government decree 715-296 of 23 June 1960 'On the Production of Various Launch Vehicles, Satellites, Spacecraft for the Military Space Forces in 1960-1967' included authorization for Korolev to develop draft projects on themes KS (heavy manned spacecraft, 2-3 crew, to demonstrate rendezvous, docking, and controlled flight, to be developed in 1961 to 1963) and KL (manned spacecraft for lunar flyby - to be developed in 1961 to 1964). The work was therefore upgraded to a project sector, under the leadership of Timchenko, in 1961. The 1960 studies considered various configurations of ballistic capsule, 'Utka' winged schemes of conventional aircraft layout, and tail-less hybrid configurations. Each configuration had a complete theoretical study, from the standpoint of aerodynamics, trajectories, resulting spacecraft masses, thermal protection requirements, and so on. By the end of 1960 it was found that the winged designs were too heavy for launch by the R-7 and in any case presented difficult re-entry heating problems that were beyond the existing technology. Studies of re-entry trajectories from lunar distances showed that a modest lift-to-drag ratio of 0.2 would be sufficient to lower G forces and allow the capsule to fly 3,000 to 7,000 km from its re-entry point and land on the Soviet territory. When the existing guidance accuracies were taken into account, this was increased to 0.3 to allow sufficient maneuverability to ensure the capsule could land within 50 km of the aim point. Section 11 had conceived of the modular scheme to reduce the mass of the re-entry vehicle in 1960. This was dubbed 'Soyuz'. Section 9's competing design, 'Sever' was two modules, like Apollo. Further iterative studies in 1961 to 1962 reached the conclusion that the Soyuz should consist of four sections. Use of this approach would result in a re-entry capsule 50% smaller than Sever. From fore to aft these modules were the living module; the landing module; the equipment-propulsion module; and an aft jettisonable module, that would contain the electronics for earth orbit rendezvous (this was to be jettisoned after the last docking was completed and before translunar injection. 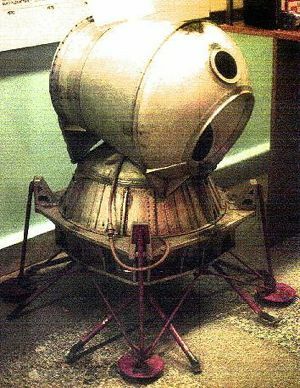 Until recently this compartment on the early Soyuz models was misidentified as a 'toroidal fuel tank' by Western space experts). Put all systems and space not necessary for re-entry and recovery outside of the re-entry vehicle, into a separate jettisonable 'living module', joined to the re-entry vehicle by a hatch. 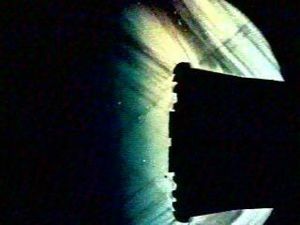 Every gram saved in this way saved two or more grams in overall spacecraft mass - for it did not need to be protected by heat shields, supported by parachutes, or braked on landing. As a bonus the living module provided an airlock for exit into space and a mounting area for rendezvous electronics. Use a re-entry vehicle of the highest possible volumetric efficiency (internal volume divided by hull area). Theoretically this would be a sphere. But re-entry from lunar distances required that the capsule be able to bank a little, to generate lift and 'fly' a bit. This was needed to reduce the G forces on the crew to tolerable levels. Such a maneuver is impossible with a spherical capsule. After considerable study, the optimum shape was found to be the Soyuz 'headlight'. The end result of this design approach was remarkable. The Apollo capsule designed by NASA had a mass of 5,000 kg and provided the crew with six cubic meters of living space. A service module, providing propulsion, electricity, radio, and other equipment would add at least 1,800 kg to this mass for the circumlunar mission. The Soyuz spacecraft provided the same crew with nine cubic meters of living space, an airlock, and the equipment module for the mass of the Apollo capsule alone! The modular concept was also inherently adaptable. By changing the fuel load in the equipment module, and the type of equipment in the living module, a wide variety of missions could be performed. The superiority of this approach is clear to see: the Soyuz remains in use 30 years later, while the Apollo was quickly abandoned. Although only Korolev was authorized to do draft project work on lunar themes, the other Chief Designers pursued alternate approaches. Chelomei was Korolev's arch-rival, and had the advantage of having Nikita Khrushchev's son in his employ. He was said to have been ordered informally by Khrushchev on 13 May 1961 to begin development of a manned circumlunar spacecraft in response to the American Apollo program. This would be launched by his UR-500 rocket, already being designed as authorized in the same June 1960 decree that started work on Soyuz. The advantage of using the UR-500 was that a manned spacecraft could be launched around the moon in a single launch, as opposed to the complex earth-orbit assembly techniques being refined by Korolev. Funds for design work on the LK-1 were available from the Kosmoplan and Raketoplan projects. 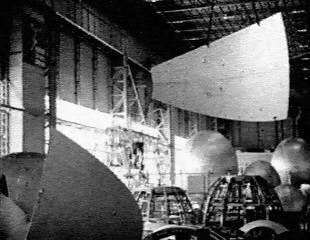 These were lifting-body unmanned and manned vehicles being designed by Chelomei for a range of military and planetary exploration missions as per the June 1960 decree. The first 1961 draft of the Soyuz project (codes KS, KL, and Vostok-Zh of the 1960 decree) would exploit the modernized Vostok-Zh. Three rocket stages would be assembled in low earth orbit using a manned Vostok tug. They would then launch a Soyuz capsule on a lunar flyby and return to earth. In the definitive December 1962 Soyuz draft project, the Vostok was gone and Soyuz A appeared as complete two-place spacecraft. 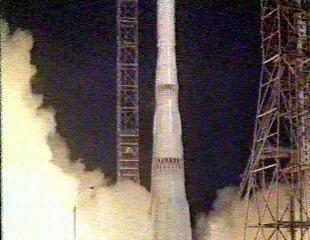 The project included two other spacecraft - the Soyuz B 9K rocket acceleration block and Soyuz V 11K tanker. All of these would be launched into orbit by Soyuz 11A511 boosters. A circumlunar mission would begin with launch of the 9K tanker block. This would be followed by three or four 11K tankers, which would automatically rendezvous and dock with the 9K. They would transfer up to 22 metric tons of propellant. Finally the 7K spacecraft with the cosmonauts aboard would be launched, dock with the 9K, and be propelled on a lunar flyby trajectory. Korolev understood very well that financing for a project of this scale would only be forthcoming from the Ministry of Defence. Therefore his draft project proposed two additional modifications of the 7K: the Soyuz-P space interceptor and the Soyuz-R command-reconnaissance spacecraft. 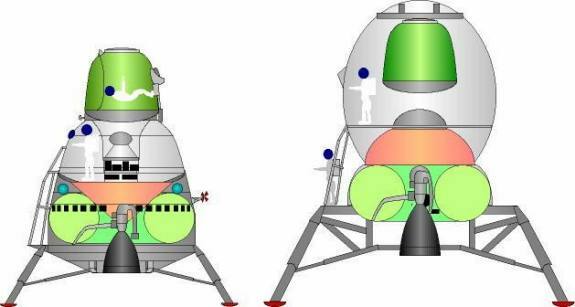 The VVS and the rocket forces supported these improved variants of the Soyuz. 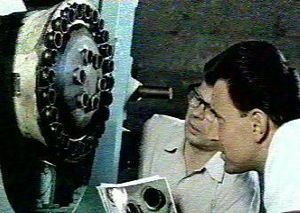 To Korolev's frustration, while Kozlov's OKB-1 Filial 3 in Samara received budget to develop the military Soyuz versions, his own circumlunar Soyuz-A was not included in the space program of the USSR. The 7K-9K-11K plan would have required five successful automatic dockings to succeed. This seemed impossible at the time. Chelomei's LK-1 single-manned spacecraft, to be placed on a translunar trajectory in a single launch of his UR-500K rocket, was still the preferred approach. But even Chelomei had no official authorization to undertake actual detailed design and development of the spacecraft or booster. Even while attempting to obtain approval for his modest R-7-launched L1 circumlunar spacecraft, Korolev was attempting to sell more ambitious schemes using his N1 super-rocket. The space race with the Americans had heated up considerably since the promulgation of the casual program of 1956. In a letter to the Central Committee of the Communist Part in January 1960 Korolev proposed an aggressive program for Communist conquest of space. This would be accomplished by development of a new rocket of 1,000 to 2,000 metric tons gross lift-off mass with a 60 to 80 metric ton payload at the earliest possible date. Among the potential payloads for his rocket in the period 1963 to 1965 Korolev proposed a spacecraft with 2 to 3 men for flyby of the moon, entry into lunar orbit, and return to earth. Payload mass would be 10 to 12 metric tons in lunar orbit with 2 to 3 metric tons return payload. This lunar orbiter would be twice as large as the L1 'loop around the moon' spacecraft. Korolev pledged to place before the Central Committee in the third quarter of 1960 comprehensive plans for development of the new projects. This letter was followed by a meeting with Khrushchev on the subject on 3 March 1960. Korolev believed it would be truly possible with backing from the very top to have a large rocket in the USSR in a very short span of time. Unfortunately at the meeting Korolev made a slip of the tongue he would always regret, admitting that his plan had not been agreed among all of the Chief Designers. 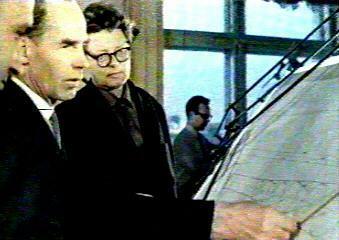 This resulted in Khrushchev throwing the matter back for a consensus plan. N-I - (Korolev) - to be developed in 1960 - 1962. 40 to 50 metric tons payload to low earth orbit and 10 to 20 metric tons to Mars. Draft project to be completed by second quarter 1961. N-II - (Korolev) - to be completed in 1963 - 1967. 60 to 80 metric ton payload to low earth orbit and 20 to 40 metric tons to Mars. Draft project to be completed in 1962. 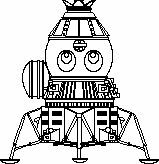 KS - (Korolev) - Heavy manned spacecraft, 2-3 crew, to demonstrate rendezvous, docking, and controlled flight. To be developed in 1961 to 1963 (this would become Soyuz). KL - (Korolev) - Manned spacecraft for lunar flyby. To be developed in 1961 to 1964 (this would become the L1). R-7L - (Korolev) - Develop in 1960 to 1962 a 4 stage version of the R-7, utilizing R-9 technology, with a 300 metric ton gross lift-off mass and high specific impulse engines in the last stage. Payload 10 metric tons to low earth orbit and 3 metric tons to escape. Draft project to be completed in 1961 (this booster, later called the Molniya-L, was never developed). K - (Chelomei) - Development of unpiloted Kosmoplans for flight to Mars and Venus with return to earth and landing at conventional airfields. These would use new exotic chemical systems, low thrust nuclear engines (nuclear-plasma, ion, atomic hydrogen). Sub-variants with a total mass of 10 to 12 metric tons and 25 metric tons would be developed in 1965-1966. Draft project to be completed in 1962. (Chelomei would expand this Kosmoplan concept to include lunar probes as well). R - (Chelomei) - Manned Raketoplan spacecraft for orbital maneuvering flight and recovery at conventional airfields. Total mass to be 10 to 12 metric tons, total gliding range during re-entry 2,500 to 3,000 km. Unpiloted version to be developed in 1960 to 1961, followed by piloted version in 1963 to 1965. Satellite interceptor operational version to be tested in 1962 to 1964 (Chelomei would later expand Raketoplan to a wide range of tasks, including manned lunar flyby and landing. The LK-1 manned circumlunar spacecraft would be designed under this heading). Note that although completion of draft projects for the N1 and L1 were authorized, no work on a N1-launched lunar landing or lunar orbiter spacecraft was included. Therefore only N-I and L1 design work officially began as a result of the final government decree 715-296 of 23 June 1960 'On the Production of Various Launch Vehicles, Satellites, Spacecraft for the Military Space Forces in 1960-1967'. By September 1960 Korolev's engineers had already settled on the N1 configuration they would defend formally in the review of the draft project nearly two years later: a monoblock 'carcass' scheme with a total lift-off mass of 2,000 metric tons and a payload of 70 to 75 metric tons. Although only Korolev was authorized to do draft project work on lunar themes, the other Chief Designers pursued other approaches. Aside from Chelomei's LK-1 circumlunar spacecraft, the Yangel and Chelomei bureaus developed alternate booster designs (Yangel's was designated R-56 and Chelomei's was the UR-700). 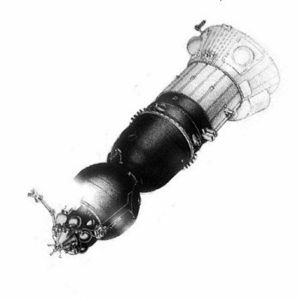 Both used clustered 4 m diameter rocket stages, equipped with a single large Glushko engine, using toxic storable propellants, with a thrust of 450 to 550 metric tons. 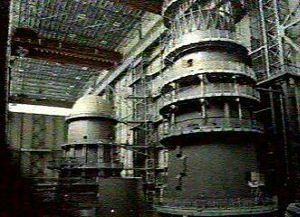 Such stages could be built in factories in Moscow or Dnepropetrovsk and shipped on the existing Soviet rail system to Baikonur for final assembly. After extensive study it was determined that the design objective of a single launch payload of 75 metric tons into a 300 km orbit best met the required payload masses for a variety of missions, among them a manned lunar orbiter and a manned lunar landing (if used with Lox-LH2 upper stages). The expert commission supported the draft project. 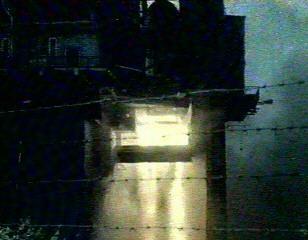 But the program was still without an authorized mission. 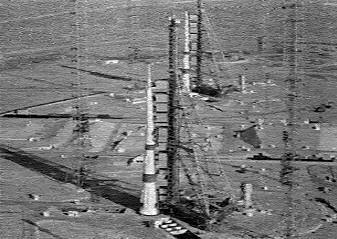 At a meeting between Khrushchev and the Chief Designers at Pitsunda in August, Khrushchev ordered start of a project to put a 75 metric ton manned platform with nuclear weapons into low earth orbit. 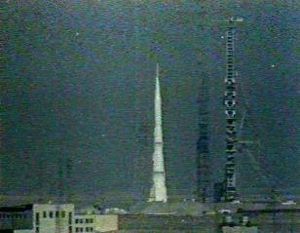 This was the initial payload; the official decree authorizing N-I production was issued on 24 September 1962 with first flight to occur in 1965. After two years of struggle, Korolev finally had his authorization to build a moon rocket - but not a spacecraft for it. This did not stop Korolev from fleshing out the ambitious lunar plans set out in the draft project and trying again for approval. On 23 September 1963 Korolev submitted his plans for space projects in the period 1965 to 1975. He now saw a clear chance to again appeal to the leadership for a manned lunar landing program. He dusted off his rejected L-1 circumlunar project, and added four new spacecraft that would allow reconnaissance, followed by landing on the moon and extended exploration of its surface. The first two projects, as before, would use R-7 based launch vehicles and extensive docking and refueling operations in low earth orbit. But elements of these would be used in the last three, which would map the moon from lunar orbit, land men on its surface, and explore it with a manned crawler. This revision to the original L1 project of 1962 had the same objective of sending two men on a circumlunar flyby trajectory. But now the Soyuz had a reverse configuration of that used earlier. From fore to aft, the modules were: the Descent Capsule (SA), Living Module (BO); Equipment Module (AO); Propulsion Module (AO); Rendezvous electronics module (NO) and Docking Unit (SU). This configuration would be important in the later N1-based projects. As before, the system consisted of the 7K manned spacecraft, the 9K rocket spacecraft, and the 11K tanker. A total of six launches of the 11A511 Soyuz booster would be required. The 9K rocket stage would be put in orbit first. It would be followed by four 11K tankers which would top off the tanks of the rocket block. Then, when all was ready, the 7K manned craft would be put into orbit and dock with the 9K stage. The stage would fire and put the manned spacecraft on a translunar trajectory. The 7K would be equipped with cinema cameras and scientific sensors to record the lunar surface during the flyby, which would be at from 1,000 to 20,000 km from the lunar surface. Total flight time was 7 to 8 days. The SA would separate from the 7K at 120 to 150 km altitude and re-enter the earth's atmosphere at 11 km-sec. After decelerating to subsonic speed, the SA's parachute would open at 10-18 km altitude. Total mass of the L1 in low earth orbit was 23,000 kg and the flyby mass of the Soyuz alone was 5,100 kg. The L2 was a project to land a remote-controlled self-propelled rover on the surface of the moon. 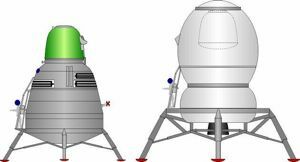 It would use the same rocket stage and tanker elements developed for the L1 manned circumlunar project. It can be seen to be the direct ancestor of the Ye-8 Lunokhod lunar rovers of the 1970's. Braking stage, for midcourse corrections and the main braking impulse for the landing on the surface. This would ignite at an altitude of 200-300 km above the surface. The landing vehicle, with throttled engines, for the soft landing on the surface at a speed of only 2 to 4 m-s. The maneuvering and guidance system for docking with the 9K in earth orbit, which was cast off before the translunar injection. 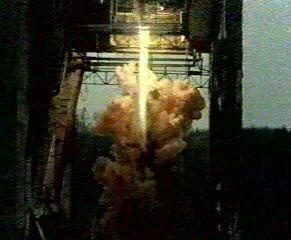 Total mass of the L-2 + 13K + 9K complex at ignition of the 9K for translunar injection was 23,000 kg. 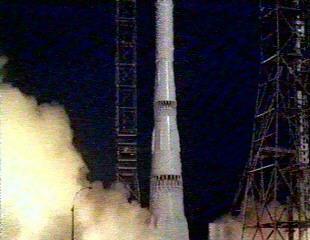 Total mass of the L-2 and 13K in their translunar cruise configuration was 5,000 kg. As was the case for the L-1, six launches of the Soyuz 11A511 booster would be required to assemble the L-2 in a 225 km low earth assembly orbit. The lunar braking stage, which included a separate midcourse correction section cast off before the braking burn. Midcourse maneuvers would be made at 100,000 and 150,000 km from the earth to ensure a landing near the site pre-surveyed by the L-2 robotic lunar rover, which would be providing a homing signal for the L-3. The lunar braking stage had a total mass of just under 40 metric tons. The main braking burn would start 200 to 300 km above the surface. The lunar soft landing-ascent stage, which had a total mass of 21 metric tons landed on the moon. The stage would use variable-thrust engines to make a soft landing at 2-4 m-s on the surface. 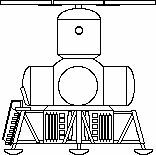 The landing leg structure and soft landing engines would be left behind on the moon. The ascent stage, which would separate from the landing legs and propel the manned capsule back toward the earth. This included the guidance system for the entire L-3 complex. The Soyuz L1 manned spacecraft, which consisted of a 2.5 metric ton equipment module and 2.5 metric ton re-entry module. It could accommodate a crew of two to three. The total L3 mission would take ten to seventeen days. 2.5 to 3.5 days would be spent on the translunar and transearth legs of the mission Five to ten days would be spent on the lunar surface. The L3 was not authorized in this form and it would over two years before a very belated start was made to beat the Americans in the moon-landing race. The L3 reformulated for the crash program would require only a single uprated N1 launch and use the lunar-orbit-rendezvous method, with a single-man lander. 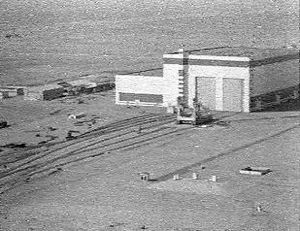 The trans-lunar injection stage, total mass 58 metric tons. If development of a fourth stage for the N1 was not authorized, this could be replaced by three sequentially-fired Soyuz B 9KM rocket blocks developed for the L-1 and L-2 projects. The lunar orbit maneuvering stage, which would have a total mass of 11.5 metric tons. This would break the Soyuz manned spacecraft into lunar orbit and returned it on its transearth trajectory. Five metric tons of propellant would be used for lunar orbit insertion. The L-4 spacecraft, which would be a modification of the 7K Soyuz. This would have a mass of 5.5 metric tons after being placed on a transearth trajectory with a descent capsule mass of 2.5 metric tons. 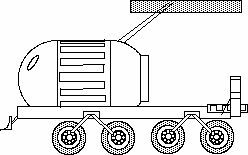 The L-5 Heavy Lunar Self-Propelled Craft would be used for extended manned reconnaissance of the lunar surface. With a maximum speed of 20 km-hour, it would provide living accommodation for three cosmonauts and 3,500 kg of provisions. The crews themselves would be landed on the moon using the L-3 complex. The lunar braking stage, which included a separate midcourse correction section cast off before the braking burn. The lunar braking stage had a total mass of just under 14 metric tons. The main braking burn would start 200 to 300 km above the surface. The lunar soft landing-ascent stage, which had a mass of 1.3 metric tons landed on the moon. Presumably the stage would make a precision landing, homing on a beacon provided by an L-2 robot scout. The stage would use variable-thrust engines to make a soft landing at 2-4 m-s on the surface. At the beginning of 1964, despite hard work in the previous year, it was apparent that there were still one to two years of development and construction to go and the target dates set in the decree would not be met. On 24 March 1964 Korolev managed another meeting with Khrushchev, where he again advocated an aggressive plan of lunar and interplanetary exploration. He dusted off his old L3 lunar landing scheme. Two variants of the L3 would be developed: the basic version would use Lox and Kerosene in Rocket Blocks G and D, with N2O4-UDMH in Block E. A later version would use Lox-LH2 in all of these upper stages. This would add 4 metric tons to the lunar surface payload. Korolev promised to have an L3 draft proposal completed in 1964 and the spacecraft in service by 1966. Development of the Lox-LH2 engines would take place from 1964 to 1967. He even pressed development of the TMK - TMK-E interplanetary manned spacecraft, using the newest designs from his bureau with nuclear electric engines. Khrushchev expressed some interest now in the lunar landing scheme, in the face of the American's evident determination to press on with project Apollo. Returning to 3 August 1964, Command number 655-268 issued by Central Committee of Communist Party gave Korolev the objective of putting one man on the moon and returning him safely to earth - ahead of the Americans (who had begun over three years earlier, in April 1961). To achieve this aim a large part of the industry had to be mobilized. It would require design of what was designated the L3 complex, with the combined launch vehicle/spacecraft termed the N1-L3. The L3 would utilize the same lunar orbit rendezvous method to achieve moon landing as was selected for the Apollo program. By upgrading the N1 from a 75 metric ton to a 95 metric ton payload capacity it was felt possible that a single N1 launch could accomplish the mission. 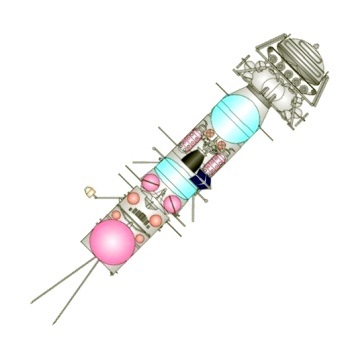 The L3 complex itself, with a total mass of 95 metric tons, would consist of a fourth stage (Block G) for the N1 to take the L3 from low earth orbit to trans-lunar trajectory; a lunar orbiter with a Soyuz re-entry capsule for return to earth (LOK); a lunar lander (LK) for the landing of a single cosmonaut on the surface of the moon; and a deceleration stage (Block D) which would brake the L3 complex into low earth orbit and then take the LK lander to near zero velocity above the surface of the moon. 1971-08-12 - Cosmos 434 - T2K s/n 3 - Final LK moon lander test using T2K version. Maneuver Summary: 188 km x 267 km orbit to 190 km X 1261 km orbit, delta V 266 m/s; 188 km x 1262 km orbit to 180 km X 11,384 km orbit, delta V 1333 m/s. No problems and Yangel is said to have died soon thereafter content that he had done his part for the program. By 1972 any thought of using the original N1-L3 hardware for a manned lunar mission had been abandoned. Instead it was planned to surpass the Americans after the Apollo flights were completed by establishing a lunar base. It may be recalled that the N1 draft project of 1962 spoke as well of 'establishment of a lunar base and regular traffic between the earth and the moon'. Korolev raised the matter informally at tea with Chief Designer of rocket complexes Vladimir Pavlovich Barmin, head of GSKB SpetsMash (State Union Design Bureau of Special Machine-Building). 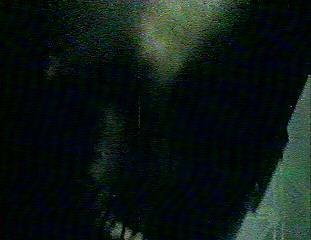 Barmin was interested in pursuing the subject, but how could such a base be placed on the moon. 'You just design the base', Korolev assured him, 'and I'll figure out how to get it there'. 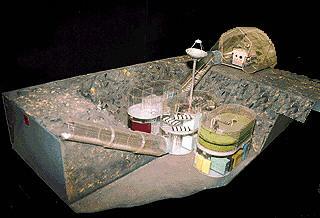 The project was known to SpetsMash as the 'Long-term Lunar Base' (DLB) and to OKB-1 as 'Zvezda'. Consideration was given to using the same elements in expeditions to other planets. Under the DLB studies SpetsMash defined purposes of the base, the principles of its construction, phases of its deployment and composition of its scientific and support equipment. The enthusiasts that worked on the project at Zvezda were naturally known as 'lunatics'. 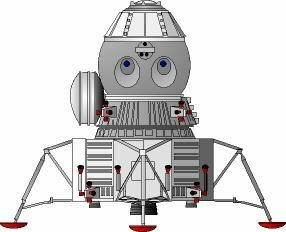 Zvezda would have utilized unmanned spacecraft designed by the Lavochkin OKB to conduct initial reconnaissance of the prospective moon base site. These would use lunar soil core drills to obtain samples of the soil and return them to earth for analysis, and Lunokhod rovers to survey the site. 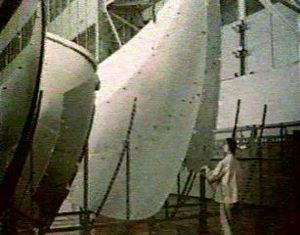 If the site was found to be satisfactory, these craft had radio beacons which would guide follow-on elements of the base to precision landings. Ambitious articulated mobile nuclear-powered Lunokhod laboratories would take the cosmonauts from the landing sites on long-duration traverses of the lunar surface. 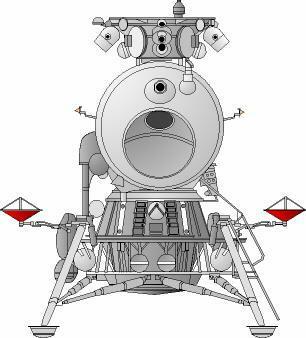 The Lunokhods were equipped with core samplers and manipulators so that the crew could conduct collection of surface samples from within the pressurized cab without the need to always exit the ship and conduct surface operations in space suits. One of the main objectives of the base would be the location and mining of Helium-3 for use in nuclear fusion reactors on earth. Rare on the earth, Helium-3 was abundant on the moon, having collected in the regolith from the solar wind. In later versions, the manned elements apparently used the improved L3 complex (designed for the follow-on two man lunar landings) to ferry manned crews from earth orbit to lunar orbit and then from lunar orbit to the surface and back. The Block Sr LOX/LH2 stage would be used to insert the components of Zvezda into low lunar orbit. 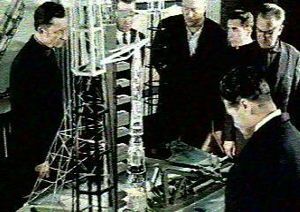 By 1971 the lunar city project was practically complete and Chief Designer Barmin arranged a meeting with Secretary Ustinov, head of all military and space rocketry. He brought along two of this 'lunatics', Aleksandr Yegorov and Vladimir Yeliseyev. The project was defended in a marathon meeting - nine presentations over six hours. At the conclusion, Ustinov agreed that the project should go ahead - but he couldn't decide, at the pace of a walk or the speed of a freight train. In the event, the point was moot. 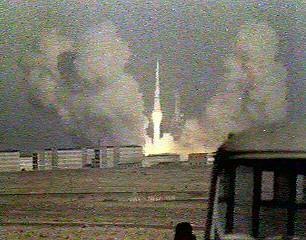 The N1 never successfully flew, and the rocket, and its associated projects, were cancelled in May 1974. In any case, the Soviet economy very likely could never have sustained the cost of the project - 80 billion dollars in 1997 prices. Unmanned elements of Zvezda designed by the Lavochkin bureau and using lunar core sampling drills designed by Barmin flew in 1969-1976 under the 'Luna' program. Although these flights were conducted in direct reconnaissance support of a manned lunar landing and lunar base, at the time it was declared that no Soviet manned lunar landing program existed, and that these unmanned flights represented a way to achieve the results of the American Apollo program without such expense and risk to life. After a number of launch vehicle failures this series of probes had some success. Luna 15 had crashed while attempting to land on the moon while the Apollo 11 astronauts were on the surface. 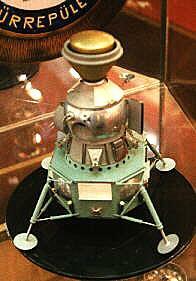 But on September 20, 1970 Luna 16 safely soft landed on the moon and then returned lunar soil to Soviet territory. Lunokhod 1 travelled about a small portion of the Sea of Rains and returned photographs. Luna 19 mapped the gravity field of the moon in preparation of later manned flights. Luna 20 returned to earth more lunar soil, and Lunokhod 2 roved around an area representing the transition zone between the lunar maria and the highlands. 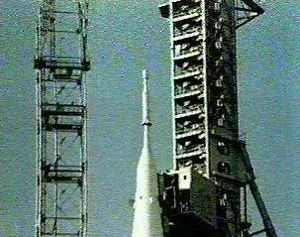 Concurrent with DLB studies, OKB-1 was already developing more powerful versions of the N1 to launch heavier payloads to the moon. The N1 growth study S. P. Korolev had signed shortly before his death had foreseen the wide use of oxygen-hydrogen propellants in modified versions of the N1 launch vehicle. It will be recalled that the 1965 study foresaw development of a Block V-II Lox/LH2 replacement for the Block B second stage of the N1. At OKB-276 N. D. Kuznetsov led a project to develop a liquid oxygen/liquid hydrogen version of the NK-15V engine with a flight thrust of 200 metric tons for use in this modernized version of the second stage of the N1. However Kuznetsov was having enough difficulty in completing satisfactory development of the conventional version of this engine for use in the basic N1 and his 200 metric ton engine did not reach the hot firing test stage. While these more ambitious plans would not be realized, the collectives OKB-2 (A. M. Isayev) and OKB-165 (A. M. Lyulka) were continuing studies and basic development that had begun in 1961. The first Russian use of hydrogen as a fuel was planned for rocket stages of relatively small size (with up to 50 metric tons of fuel). These stages, which were designated Block S and Block R, were to be introduced in place of N1 Blocks G and D as part of a modernized L3M lunar spacecraft complex. Use of oxygen-hydrogen propellants would permit expeditions to the moon of three crew, of which two would walk on the surface of the moon. Isayev set about adapting the 11D56 engine, with a vacuum thrust of 7.5 metric tons, for the Block R. This engine had originally been designed in the early 1960's for use in the third stage of an uprated Molniya-L launch vehicle. The new Block R for the N1 was to have an empty mass of 4.3 metric tons, a maximum fuel load of 18.7 metric tons, and would have been 8.7 m long and 4.1 m in diameter. 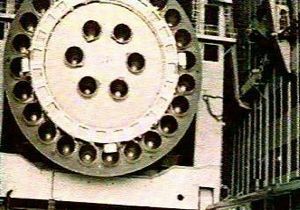 Lyulka developed two variants of a 40 metric ton engine - the 11D54 (with fixed chamber) and 11D57 (with gimbaled chamber). These would be used for the new Block V-III third stage of the N1 (3 to 6 11D54) and in the Block S (one 11D57). First hot firings of the 11D56 on the test stand began in June 1967. Both the 11D56 and 11D57 engines successfully completed their state development test series. At the Tsniimash museum in Korolev a photograph is displayed of a dynamic test model of an N1 configuration that has been called N1M. 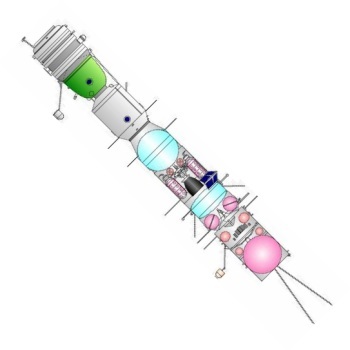 This model shows an N1 first stage, with a Block V-III second stage, and Blocks S and R third and fourth stages. Calculations indicate that a two stage Block A / Block V-III N1 would have a low earth orbit payload comparable to that of the basic N1 (around 95 metric tons). Evidently this configuration was considered as an alternative to a conventional three stage N1 for launching the L3M complex into low earth orbit. 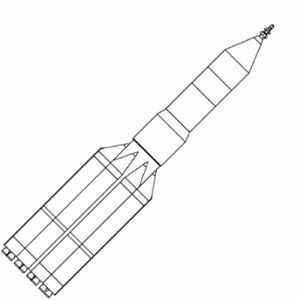 The original draft project for the new N1M-L3M lunar landing complex anticipated use of a two-launch profile. On the first launch a Block R RTB braking stage would be put on a translunar trajectory. The RTB would place itself in lunar orbit. 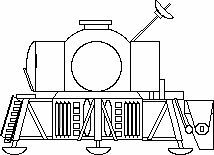 Next, the manned L3M lunar lander would be launched. This new spacecraft was much larger than the LK, with a mass of 21 metric tons landed on the lunar surface. The L3M would dock, tail-first, with the RTB stage in lunar orbit. The RTB would act as a lunar crasher stage. The L3M would separate from the RTB just over the lunar surface, then hover to a soft landing. The crew would spend up 16 days on the surface. Following completion of their work, the landing legs would be left behind, and the L3M would launch itself on a trans-earth trajectory. Just before arrival at earth, the crew would enter their Soyuz capsule, separate from the L3M, and make a lifting re-entry into the earth's atmosphere. It was felt that within the existing funding allocation of the original N1-L3 program, enough N1's would be available to support a series of landings in 1978-1980. At least two drawings of varying designs for the L3M have emerged to date. In one, the Soyuz return capsule is perched atop the landing stage. A small toroidal crew compartment provides accommodation for space-suited cosmonauts to land the vehicle on the moon. Evidently the crew, which would have been limited to two cosmonauts, would be required to space walk from the Soyuz capsule to the toroidal chamber prior to the landing attempt. A return spacewalk would have to be made after ascent from the surface. This L3M had a landed mass of 21 metric tons on the surface, an ascent mass of 18 metric tons, a trans-earth injection spacecraft mass of 5 metric tons, and sufficient supplies for 14 to 16 days of operations on the surface. This probably represents the original N1M-L3M variant. In July 1970 Kuznetsov was given authorization to design substantially improved versions of the N1 rocket engines. The N1 that would utilize these engines was designated the N1F and would have a payload to a 225 km orbit of 105,000 kg. Full go-ahead to develop a liquid hydrogen/liquid oxygen high energy upper stage for the N1F finally came in June 1970. The decision was made to develop a multi-engine Block Sr with a propellant mass of 66.4 metric tons. This single stage would be used in place of the previously-planned Blocks S and R to insert spacecraft of what was now termed the Lunar Expeditionary Complex (LEK) into low lunar orbit. It was also to be used to insert heavy spacecraft into geosynchronous orbit and on interplanetary trajectories. The revised L3M for use with the Block Sr completed design in 1972. 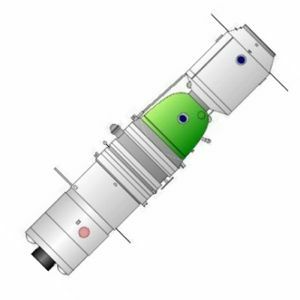 In this version the Soyuz capsule is completely enclosed in a pressurized �hangar' (the OB, cocooned habitation block) which provides the crew with accommodation space. In this variant the crew could simply step out of the capsule into the hangar area without having to don space suits and conduct an EVA. This L3M would have had a mass of about 23 metric tons landed on the surface and have allowed stays of up to 90 days by a crew of three. The two-launch scenario would still be followed, with a single Block Sr from each N1 launch taking over duties of both the Blocks S and R in the previous plan. The DU engine block would perform the same ascent stage duties as the Block E of the original LK. With the cancellation of the N1 in 1974, work on the upper stages and spacecraft for lunar expeditions did not end. The designs were simply modified for use on the replacement launch vehicle, the Vulkan. Although the N1, L3, and Zvezda projects were cancelled, Glushko still considered the establishment of a moon base to be a primary goal for his country. While the Americans had achieved the first moon landing, it was known that all moon flights after Apollo 17 had been cancelled. There existed an opportunity, through establishment of a permanent moon base, to steal the lead in the space race once again. Furthermore, analysis of the results of the previous unmanned and manned indicated that the moon was suited for a variety of 'special investigations', and that a permanent lunar expeditionary complex (LEK) would be required to accomplish this. To launch the elements of the LEK, Glushko designed a new launch vehicle, the Vulkan. The Vulkan would use the LOX/LH2 engine technology developed for the US Space Shuttle in the core stage. This would be surrounded by six strap-on boosters, using LOX/Kerosene engines, to be developed by NPO Yuzhnoye in the Ukraine. This use of cryogenic propellants represented a complete turnaround for Glushko, who had advocated use of storable but toxic rocket propellants in a bitter fight with Korolev and Mishin for fifteen years. The LEK consisted of expeditionary and transport lunar spacecraft (Chief Designer K D Bushchev) and equipment for the permanent base station (Chief Designer I S Prudnikov). LEK (Lunar Expeditionary Spacecraft). As in the original LK lunar lander, this would be taken to near zero velocity near the lunar surface by the Vulkan Block V 'lunar crasher' rocket stage. It would then descend to the lunar surface using a landing stage nearly identical to the American lunar module descent stage. This landing stage however would primarily provide propulsion of the upper Ascent/earth recovery stage to a trans-earth trajectory. The Ascent/earth recovery stage consisted of a re-entry capsule in the shape of but larger than the Soyuz descent module, encapsulated in a larger pressurized volume providing crew quarters and equipment storage. Cutaway view of 1963 L1 circumlunar spacecraft. 1963 L2 robot lunar rover spacecraft. L2 configuration speculative based on early Ye-8 rover design studies at OKB-1. 1963 L3 manned lunar lander using earth-orbit rendezvous method. Configuration based on description and lander configuration of early L3M design. 1963 L4 manned lunar orbiter. 1963 L5 manned lunar rover. Drawing based on model at Tsniimash museum. 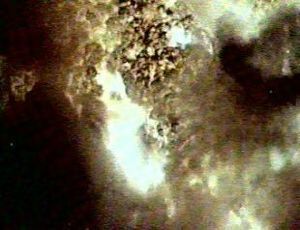 Final explosion of N1 5L, destroying pad. 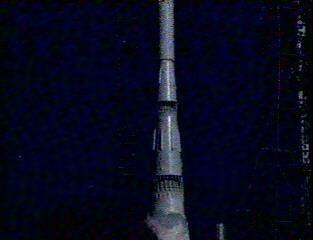 Having just cleared the tower, N1 5L falls back onto the pad at a 45 degree angle. N1 5L Clears the tower but falters as the KORD system incorrectly shuts down engines. Engine ignition of N1 5L. 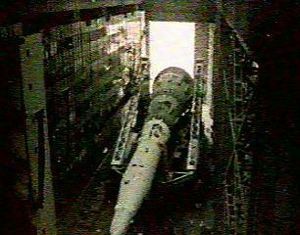 N1 tank sections were built in Samara, then shipped to Baikonur for assembly of the launch vehicle. Subassemblies from Samara were built up into stage bulkheads on assembly jigs at Baikonur.